Castle Dome was just one celebrated gunfight from being an international tourist destination rivaling Tombstone. All the other elements were there: booming silver mines, a rowdy populace with a colorful cast of characters and plenty of gunplay. Only none of it was perpetuated by an Earp, and that makes a big difference. For example, one shootout in Castle Dome (documented in a new exhibit) was over a stolen hand-winch. Not the sort of epic feud that makes Hollywood moguls start speed-dialing Sam Elliott. But today, what Castle Dome Mines Museum does better than Tombstone -- better than other ghost towns, historic districts or traditional museums -- is provide an authentic glimpse into everyday life in an Arizona mining town. Tucked away in the sun-splashed outback of the Kofa National Wildlife Refuge, northeast of Yuma , Castle Dome isn't hard to reach but is just isolated enough to stay off the radar of most tourists. Otherwise, this remarkable place would be teeming with visitors. Nestled at the foot of craggy mountains patrolled by desert bighorn, Castle Dome offers an unforgettable blend of scenery and history. Since buying the property in 1993, Allen and Stephanie Armstrong have created a sprawling museum. They started with a handful of original buildings still standing. More structures were hauled in from outlying mines, while others were constructed on-site using salvaged materials. Today, visitors can prowl through 50 buildings, including a hotel, doctor's office, church (with functional bell tower), blacksmith shop, assay office, sheriff's office, jail and several saloons. And you'll be hard pressed to determine which buildings are original and which are re-creations. "I was a stone mason and went on to build log cabins using found material," Allen Armstrong said. "We had a homestead in Washington where we did everything by hand. So it was all pretty good practice for this place." What makes the now-bustling ghost town so intriguing is that each building is packed to the rafters with period furniture, equipment, accessories and artifacts. Each self-contained mini museum fills in a piece of the larger picture of what life must have been like in this hardscrabble frontier. Castle Dome, 40 miles northeast of Yuma, contains the longest-working mine in Arizona. It operated from 1862 to 1979. During its heyday, 3,000 residents lived here despite blistering summer temperatures. Jacob Snively, who had served with Sam Houston, is credited as the first American to discover the rich silver and lead deposits. Yet he followed a trail blazed by Spanish conquistadors who mined here in the 1600s. The district holds the second mine to be patented in Arizona, the Flora Temple in 1871. The Castle Dome Mine was patented in 1876. With no railroad access, tenacious ingenuity was required for ore shipments. In 1878, Castle Dome Mine built the world's largest wagon with a capacity of 20 tons. The wagon required a team of 40 horses or mules to pull. Castle Dome didn't follow the predictable boom-bust cycle of most mining towns. An ebb and flow of activity swept the town along. Large-scale lead mining erupted during both world wars to meet the demand for bullets. During World War II, miners extracted 9 million pounds of lead ore, making Castle Dome one of the largest wartime producers in the country. The mines closed for good in 1979. Most of the artifacts on display in Castle Dome Mines Museum were pulled from surrounding mine shafts. For years, Armstrong has been exploring the 300 shafts gouged into the landscape, often rappelling 250 feet into the darkness. He has entered shafts that have been sealed off for a century or more and uncovered a trove of items exquisitely preserved by the right mix of temperature and humidity. "We went into one drift where it looked like the miners might be back any minute," he said. "Dynamite was still in the holes, fuses were there, and blasting caps. They were all set to fire off another round. And on the floor was a newspaper with the headline, 'Bulgaria Surrenders, Hostilities End.' It was the end of World War I. I could just envision the foreman coming down and telling everyone it was their last day of work and they just walked away." Armstrong has found miners' equipment, documents, love letters, bottles, tobacco cans, powder boxes, canned goods, 100-year-old matches that still strike, hats and clothing, including a pair of Levi's blue jeans dating to 1890. He also has found boots and stirrups from conquistador times. "The people left in such a hurry. In a lot of cases, I think they planned to come back," Armstrong said. "They just didn't make it. This is a tough place to get back to." The newer exhibits include a two-story doctor's office. Fifteen mannequins on the first floor introduce characters of the town and re-create the gunfight over the filched hand-winch. Be sure to venture upstairs to admire the authentic bottle windows Armstrong built using bottles recovered from the mines. Allen and Stephanie Armstrong, a former teacher, research their finds and document the stories. So every building bristles with rich details of the lives led -- and lost -- at Castle Dome. Visitors can wander the grounds at their own pace, soaking it all in. Wooden floors creak at every step. A soft breeze rustles sun-faded curtains. Sit in one of the saloons for a few minutes and the echoes of the past swirl about. Instead of seeming haunted, the place feels vibrant. "One of the things that make this place special is that, despite the longevity, not all that much changed," Allen Armstrong said. "They were still hand-drilling during World War I. So it's really retained the flavor of the past. That's what we're trying to preserve." What: The museum is divided into two sections. The main part consists of the ghost town, where most of the buildings are clustered. The second part is a self-guided walking tour through the mining district. A sandy path leads past a mill, bunkhouse, cookhouse, cabins, graveyard and the entrances of several mines, including Spanish workings dating to the 1600s. Where: About 185 miles southwest of central Phoenix. Take Interstate 10 west to Quartzsite, then U.S. 95 about 45 miles south. At mile marker 55, turn east onto Castle Dome Road and follow signs for about 10 miles. The first 3 miles are paved; the next 7 are well-maintained gravel. Mining District northeast of Yuma. 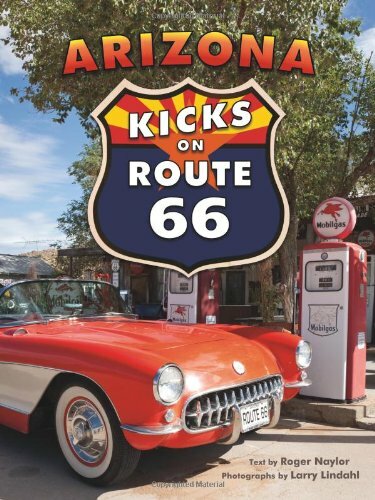 You might also be interested in "Arizona Kicks on Route 66" by Roger Naylor, available on Amazon! Enjoy Roger's awesome writing style about "funky diners, natural wonders and two lanes of freedom"! It will make you smile!